Images and sounds of war, natural disasters, and human-made devastation explicitly surround us and implicitly leave their imprint in our muscles, our belly and heart, our nervous systems, and the brains in our skulls. We each experience more digital data than we are capable of processing in a day, and this is leading to a loss of empathy and human contact. This loss of lei Images and sounds of war, natural disasters, and human-made devastation explicitly surround us and implicitly leave their imprint in our muscles, our belly and heart, our nervous systems, and the brains in our skulls. We each experience more digital data than we are capable of processing in a day, and this is leading to a loss of empathy and human contact. This loss of leisurely, sustained, face-to-face connection is making true presence a rare experience for many of us, and is neurally ingraining fast pace and split attention as the norm. Yet despite all of this, the ability to offer the safe sanctuary of presence is central to effective clinical treatment of trauma and indeed to all of therapeutic practice. It is our challenge to remain present within our culture, Badenoch argues, no matter how difficult this might be. She makes the case that we are built to seek out, enter, and sustain warm relationships, all this connection will allow us to support the emergence of a humane world. In this book, Bonnie Badenoch, a gifted translator of neuroscientific concepts into human terms, offers readers brain- and body-based insights into how we can form deep relational encounters with our clients and our selves and how relational neuroscience can teach us about the astonishing ways we are interwoven with one another. How we walk about in our daily lives will touch everyone, often below the level of conscious awareness. 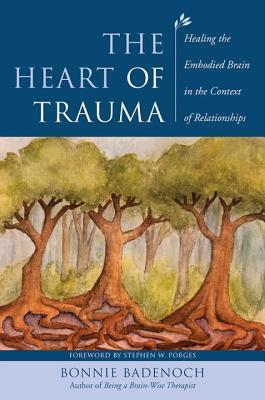 To ask other readers questions about The Heart of Trauma, please sign up. Is there a heart of trauma? Or is the way we approach our own traumas and those of others one of the most challenging and most revealing testimonies of our hearts? In The Heart of Trauma, trauma therapist and writer Bonnie Badenoch held my attention from the very first page to the very last. She reminds us that the effects of trauma persist throughout our body, mind and soul when we are left alone to experience the most unimaginable, terrifying and brutal aspects of life. It is through the compani Is there a heart of trauma? Or is the way we approach our own traumas and those of others one of the most challenging and most revealing testimonies of our hearts? She reminds us that the effects of trauma persist throughout our body, mind and soul when we are left alone to experience the most unimaginable, terrifying and brutal aspects of life. It is through the companionship of another, who accompanies us to those places from an attuned and co-regulated place, that we are most likely to heal. In a world that increasingly encourages technique and symptom management over compassion and the art of therapy, this book takes its important place as a reminder of the need for humanity and care, as well as therapeutic expertise.